Discussions Magazine Music Blog: THE LAUGHING DOGS/The Laughing Dogs & ...Meet Their Makers CD review! 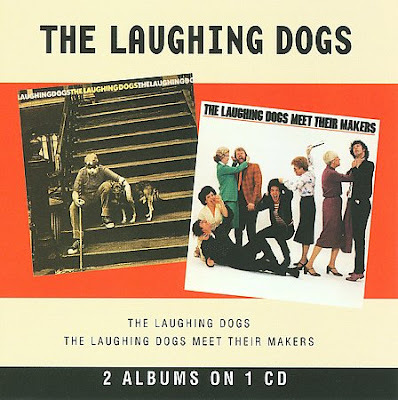 THE LAUGHING DOGS/The Laughing Dogs & ...Meet Their Makers CD review! Yes, folks, the first two albums by THE LAUGHING DOGS have been officially released on one CD, courtesy of the American Beat label. I've been a fan of this relatively unknown band for three decades and can still remember the first time I heard each of these fab albums. In fact, I even reviewed the individual albums (then only on out of print vinyl) for All Music Guide. Now that they've been made available on CD, I get another go round to heap my praises on these two albums... and I'll share my All Music Guide reviews with you right here on this blog! "When I first reviewed the first two Laughing Dogs albums years ago, they were only available on black wax… and long out of print. Heck, I was certain that no label would ever be brave or smart enough to actually put these albums out on CD! But, lo and behold, American Beat has risen to the occasion and now you can own these two great Power Pop albums on one CD. Though they never made much of a dent in the charts, the Dogs’ reputation as skilled musicians is legendary. The fact that they would masquerade as The Kojaks (complete with bald caps) and be their own opening act is STILL talked about! But none of this holds a candle to their knack for serving up melodic hooks galore on these two albums. The quartet’s 1979 self-titled debut was energetic and laced with musical nods to their ‘60s influences, right down to the production. Still, the band were able to maintain their own identity and forge a ‘Laughing Dogs’ sound, especially with album opener “Get ‘im Outta Town” (a sound which they fully explored on their second album). Apart from that lead-off track, album highlights include the Pop-errific “Reason For Love”, “No Lies” and the Beatles-esque “Low Life”. Their sophomore album, …Meet Their Makers, was released in 1980 and showed a maturity in the band’s songwriting and arrangements. Though the rawness of the debut is missing here, the sympathetic and warm production allows the songs to breathe, and they are often stunning. With originals like "Formal Letter," "Take My Chances," “Zombies” and "Reach Out For Me," who needs covers like "Don't Bring Me Down" (the only lukewarm tune here). When the band slows everything down for a ballad ("Stand Up" and "Two Who Are Willing To Share"), you can't help but reach for the Bic lighter! So, do you own this CD already? What are you waiting for?